He pauses, carefully placing three wine glasses in front of him on the Formica-topped table. With these six words, we know we are in the right place. And where, exactly, is that? Embarking with Rohit and about 20 other students on a journey through the major winemaking areas of France – Bordeaux, Burgundy, Rhone, and other regions – plus Italy and Spain as part of our European Wine Appreciation class. Long before we created Great Flavors, we have been developing greater appreciation for wine and a thirst (no pun intended) to know more and more and more: differences in grape varieties, why the taste of the same grape can differ depending on area, how different soils and rain and sun affect the wine, the winemaking process, and other unique aspects of wine. To an enology student or wine industry professional, these may be simplistic topics, but we are neither majoring in wine-related subjects at Cal Poly, nor winemakers or employees of a winery. To us, these early questions began sparking our curiosity and growing fascination with the industry. Early on, we had an instinct about the wine industry that we wanted to explore. From wonderful opportunities to spend some time with generous and talented winemakers and quality wineries like Stephen Ross, Talley Vineyards, and Tablas Creek Vineyard, we were able to confirm our inkling: making great wine is as much art as science. It isn’t just about harvesting grapes, letting them ferment, and funneling the fermented juice into a bottle. If it was that easy, every wine made with the Acme Home Winemaking Kit would garner 95 points from the various ranking entities. No, we knew there was art and instinct and maybe a little vineyard magic in every bottle of good wine. We wanted to learn more – both for our own education, and also to share this fascinating and deep-rooted global profession and artistry with our Great Flavors community. 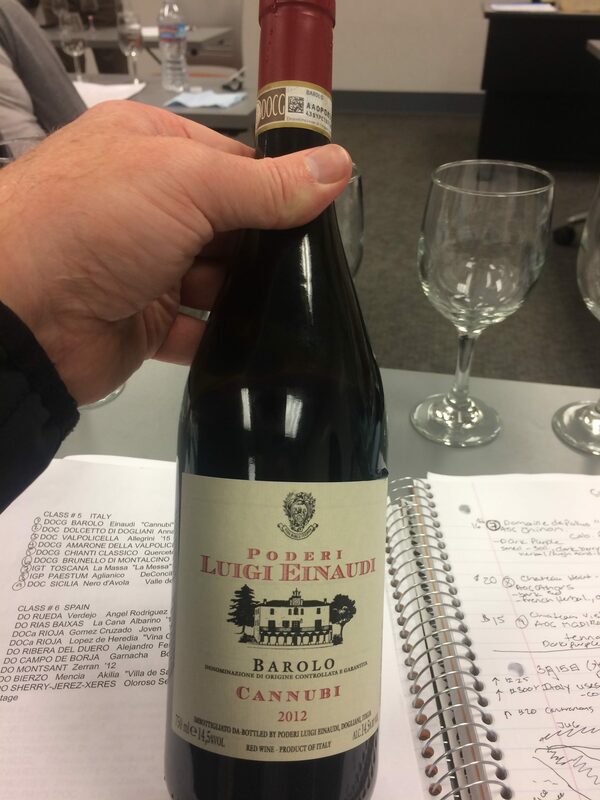 One of many wines tasted in the European Wine Class offered by Cal Poly’s Extended Education program, taught by Mike Botwin. We all know the quickest and most effective path to learning any subject is to find a good teacher. Books and videos can share data and details of a subject, but true learning and understanding come only from experiencing the topic with the guidance of a mentor in a conducive environment. Because Cal Poly is nationally renowned for its degreed wine program, with branches in viticulture, enology, and wine business, we start looking at its Extended Education program for wine-centered classes to begin our more formal education. Ironically, our first-choice class—California Wine Appreciation—is cancelled, but we’re informed we can take the European Wine Appreciate class instead. Other classes offered at different times of the year are Wines of the Southern Hemisphere and Sensory Evaluation of Wine. As we all take our seats at the U-shaped configuration of tables in Room 123 of the Graphic Arts building, there’s a palpable new-kid-on-the-first-day-at-school nervousness in the air. Our teacher, Michael Botwin, who’s also chairman of the SLO chapter of the American Wine Society, quickly puts any fear to rest as he distributes the handouts for class with maps, regions, terms, and the all-important list of the actual wines we’ll be tasting in every class. Most students are like us: interested in learning more about wine, both the production process and the nuances captured in the bottle after the grape’s journey has been completed. A few students are from local wineries, including Tablas Creek, Hammersky, and Saucelito Canyon. One student, Andrew, who is the Events Coordinator at Niner in Paso Robles, is also studying for his Sommelier 2 exam. We make a mental note to talk with Andrew later. Regardless of our backgrounds, it’s clear we all believe that good wine paired with good food and shared with people we enjoy helps make for a great-flavored life. 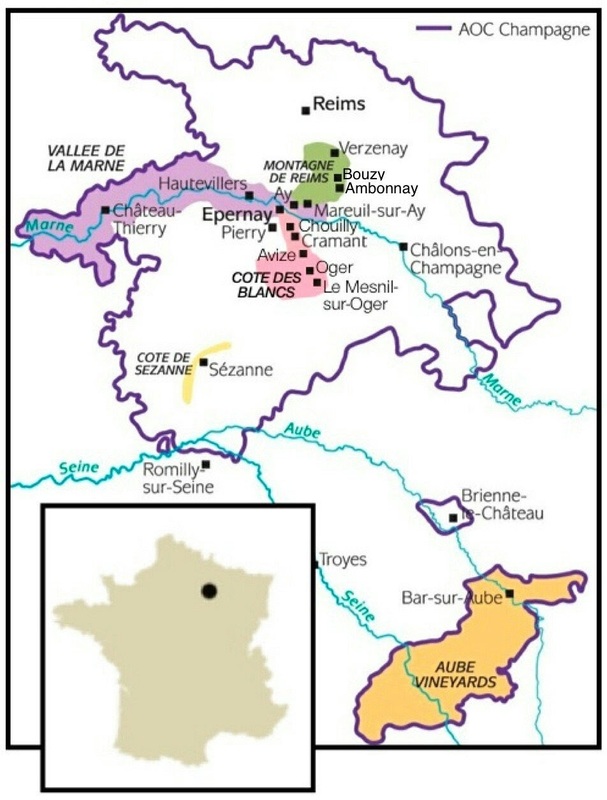 Over the next six weeks, we learn a lot about Europeans wines from Mr. Botwin, including the meanings of AOC and Cru, DOCG and DOC, geography, and climatic and cultural influences in the major winemaking regions of France, Italy, and Spain. He has an easy-going and humorous way of teaching that’s based on deep knowledge, not ego. As we taste our way around Europe with eight or more bottles of wine in each class, we realize we’re learning a ton in a fun and memorable way. It’s so worthwhile to taste, smell, and experience each wine from a certain region while talking about it in a group environment, sharing experiences and impressions. We talk a lot about how climate, process, geography, and traditions affect a wine’s expression and personality. This approach brings a multifaceted and multidimensional aspect to the learning, making it easier to learn, enjoy, and integrate the information. We also learn a lot from Rohit during the class. His passion as a wine chemist is clear and he loves sharing the chemical and environmental reasons behind certain wine characteristics. He’s also generous with answering The Flavor Team’s specific questions after classes. As the weeks pass, Andrew also answers our questions about the Sommelier 1 exam, which we’re considering taking. By the end of the course, it’s official: The Flavor Team is signing up for Somm 1 in the fall. 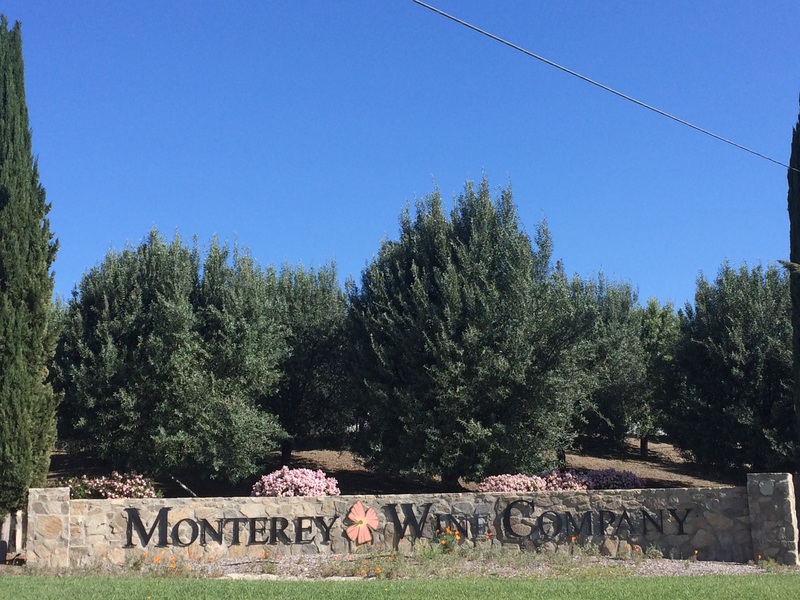 As we near the end of course, Rohit invites us to come up and tour Monterey Wine Company. He wants us to meet his lab teammates and learn more about what they do to help their winemaker clients bring their best wines to fruition. A few weeks later, we’re exiting Highway 101 at King City, home to the west entrance of Pinnacles National Park and Monterey Wine Company, a full-service custom crush facility founded in 2002 that offers some of the best technology in the industry, according to trade publication Wines & Vines. As we enter the bright atrium of Monterey Wine Company, we leave behind the warmth and sun that makes this area the produce basket of the world. 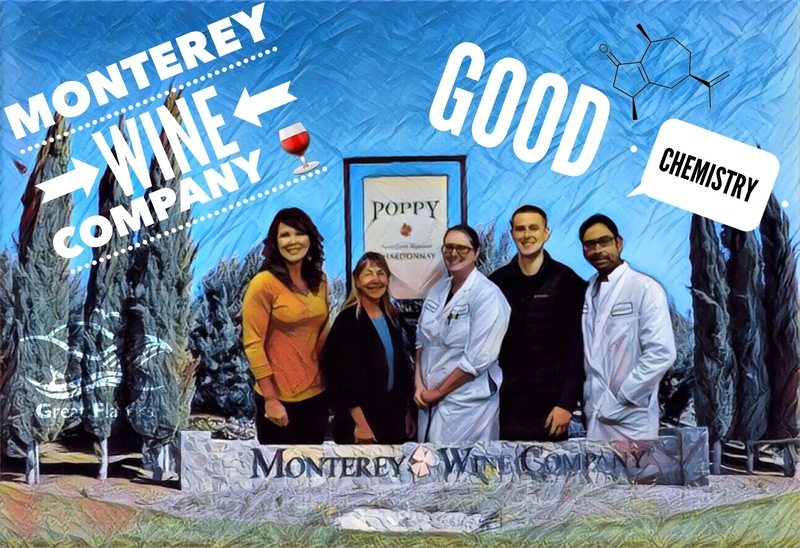 Monterey Wine Company Lab Team, aka the Wine Chemists: Richard Dempsey, Lab Manager; Rohit Deshpande, Lab Analyst; Megan Burroughs, Lab Analyst. 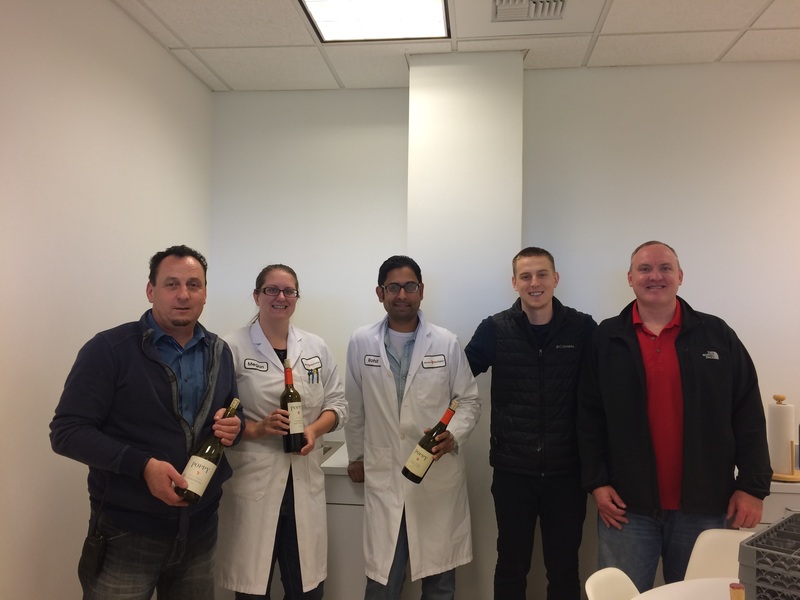 Our classmate Rohit Deshpande introduces us to Shannon Valladerez, Director and General Manager, and his MWC lab teammates, aka the Wine Chemists: Richard Dempsey, Lab Manager; and fellow Lab Analyst Megan Burroughs. All chemical engineers, the lab team is mutually excited to bring their knowledge to an industry that continues to evolve. After a quick overview of MWC history and a bit of context, we head out to begin our tour of the facility. As we pass through the shadows cast by rows and rows of fermentation tanks, we notice flashes of light tracing the ceiling of the huge building. Ranging in size from 1,000 to 55,000 gallons, the tanks hold the current annual MWC custom crush production of about 2,500 – 3,000 tons. That’s a virtual drop on the bucket, however. Full capacity is a whopping 17,000 tons. Climbing the stairs to the hopper which receives the grapes after they’re weighed, Richard explains who their clients are. “Our focus is the mid-range to the largest clients,” he shares, “which produce 100,000 to 500,000 tons annually.” Client’s fruit comes from miles around —San Luis Obispo county, Napa and Sonoma, the Sierra Foothills, and more. We ask the obvious question: why do clients use MWC, many of which return year after year? Gabilan Mountains from the hopper platform. 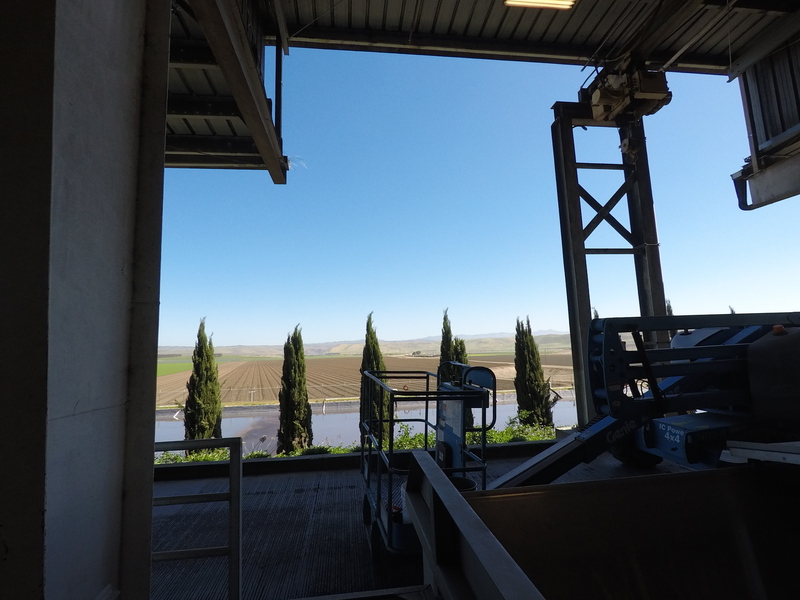 With one last look at the majestic view of the Gabilan mountain range from the hopper platform, we make our way down to the presses – in three sizes to match each client’s tonnage. From there, we pass the cross-flow filter and the glycol-jacketed white wine chillers, where the “wine diamonds” — tartaric acid and potassium crystals — solidify and settle to the bottom of the tank during the cold stabilization process. 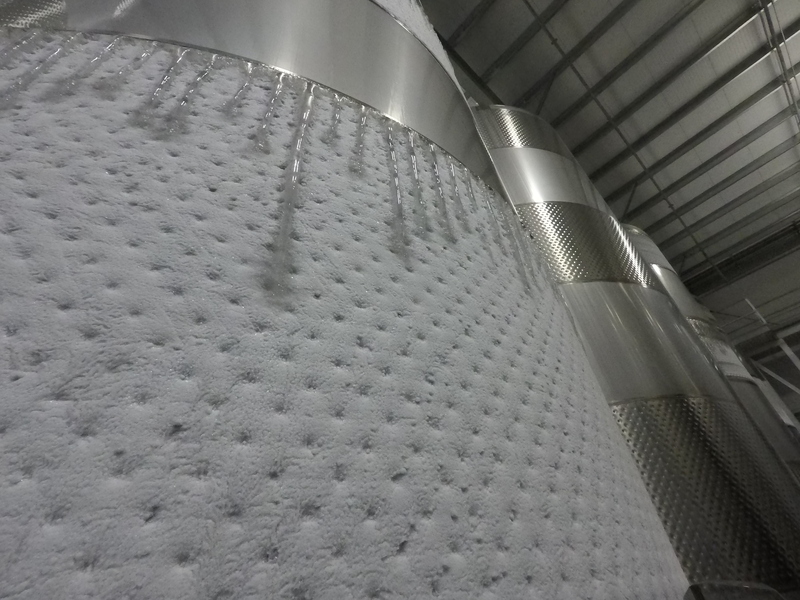 In other tanks, the converse process — heat stabilization —allows proteins in red wines to precipitate when bentonite is added. Both of these processes are services MWC can provide clients, based on their individual Client Protocol, which is updated each year before winemaking starts. 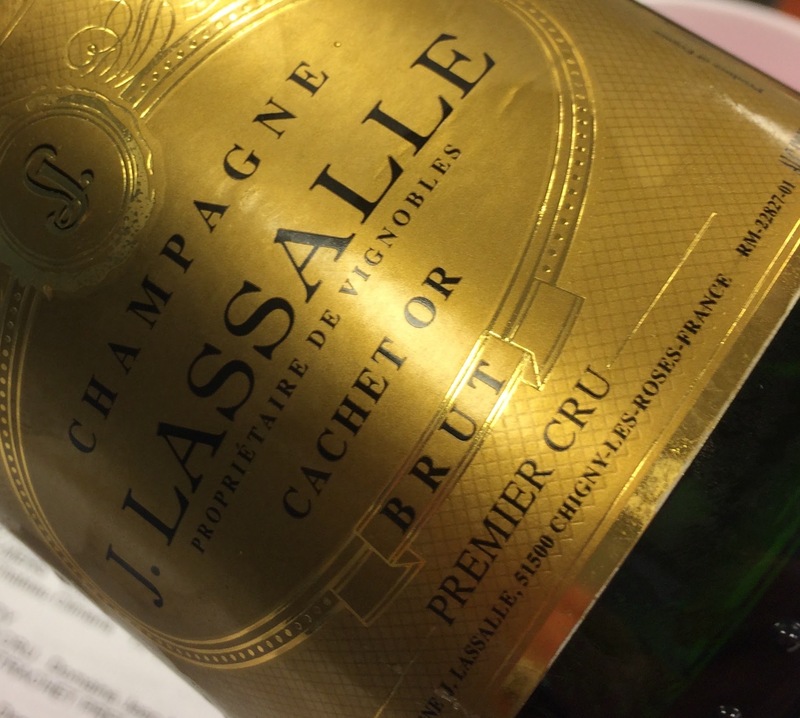 The winemaker may adjust the protocol based on the year’s grape quality and quantity, environmental effects (such as smoke from the large fires in 2016), and ongoing refinements in a brand’s evolution. Clients can choose additional state-of-the-art services including Flash Détente, reverse osmosis, and alcohol adjustment to meet certain taste criteria or tax bracket requirements. As affiliate division of MWC captures the alcohol for use in fortified wines, spirits, or to be sold as ethanol. Not only that, but MWC offers vineyard management and grape testing during the growing season to measure maturity and harvest timing for optimal grape quality. One of MWC’s signature technology offerings is Flash Détente. The first such system was brought to the US by E&J Gallo in 2009 for a small percentage of its personal family wines. MWC purchased the first commercial equipment in the US in 2009. 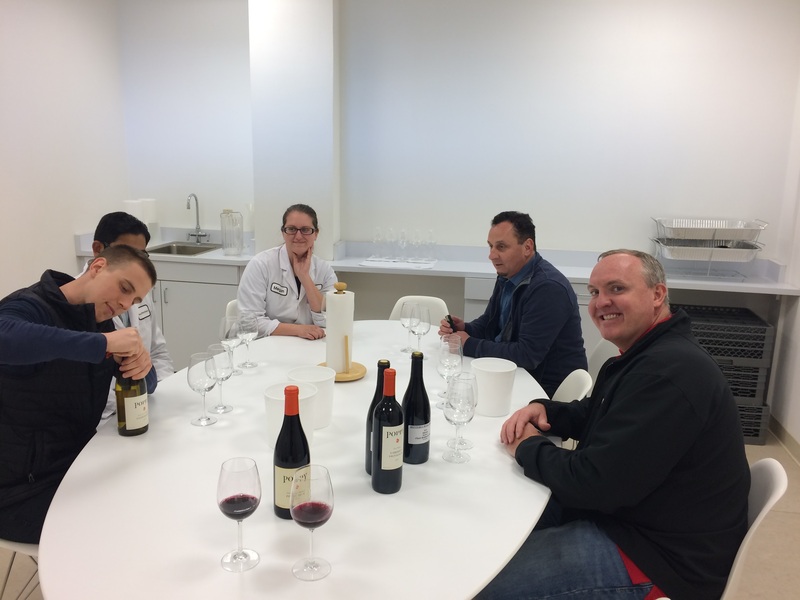 After becoming well versed in its capabilities, MWC provided training and findings to the enology programs at UC Davis and Cal Poly, as the universities began using the equipment and exploring its benefits to the wine industry. A process initiated before fermentation, Flash Détente quickly brings the grapes up to a high temperature and then rapidly cools them. The quick heating and cooling releases tannins immediately (rather than waiting for tannin development in fermentation) and results in uniform grape bursting, which provides maximum juice release and extraction. This technology can be a boon in low harvest years, and it can bring out the best in from lower quality grapes due to various environmental factors. As we marvel at the frost layer on the cold tanks and hear stories about falling icicles, this is when we realize how high tech and high touch merge at MWC. Everything done at MWC is client-driven based on individual protocols. So, for example, while MWC can provide everything from grape press to bottling — plus many technological services along the winemaking process like heat and cold stabilization and Flash Détente — it is completely up to each client what they choose. MWC’s experience with hundreds of styles of wine and most grape varieties can help the smaller or less-experienced winemaker create an exceptional wine, and it can help large producers maximize results. 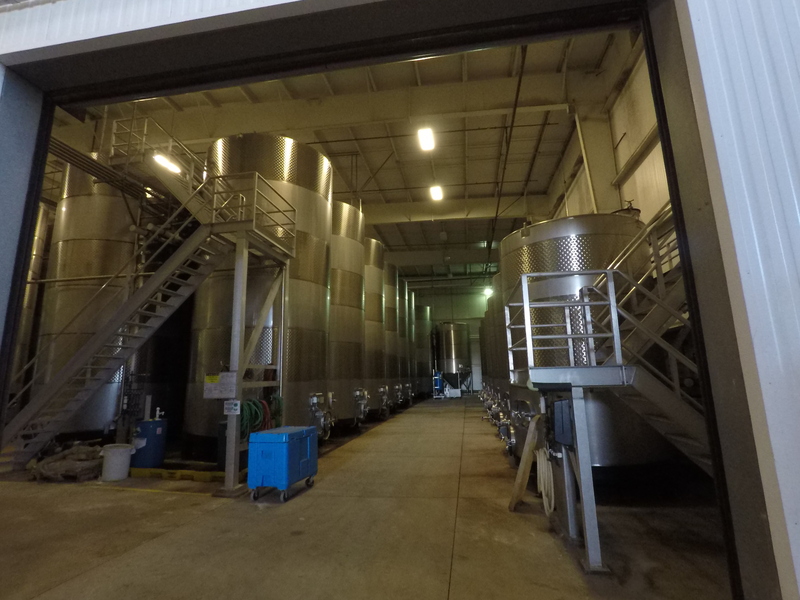 No matter the size of the client, MWC’s expertise comes into play with creative solutions to the challenges that commonly occur during winemaking. Wine tanker awaits its precious cargo. 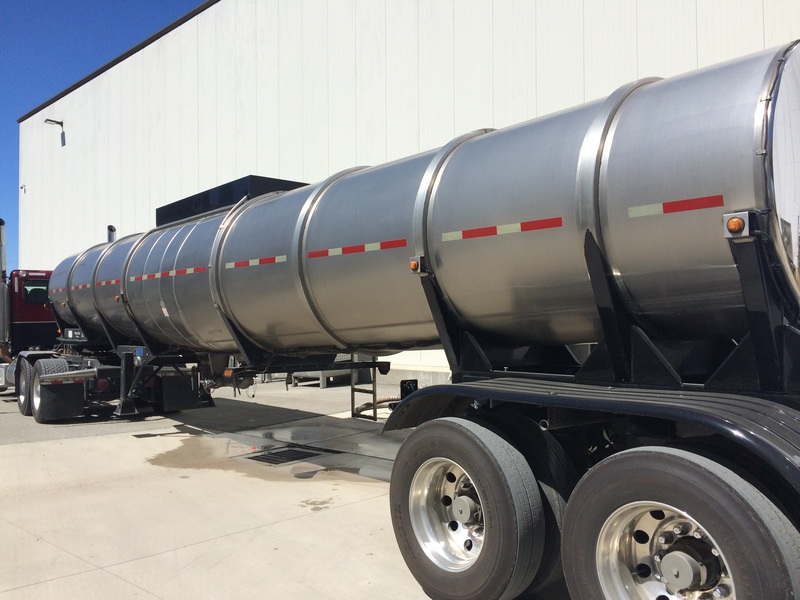 In other cases, clients truck their finished wine from MWC back to their own wineries for bottling, typically using wine tanker trucks holding 6,000 to 7,000 gallons. 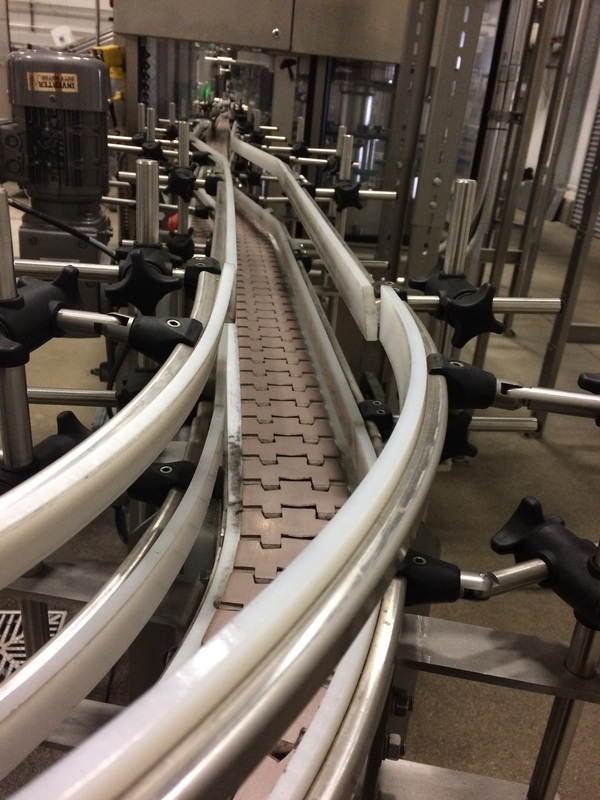 The bottling line is a marvel of complexity and efficiency. “Our capacity is about 750,000 cases a year,” says Richard. The bottling line can handle 750,000 cases a year. The MWC quality control team oversees every step in the bottling process. Every 30 minutes, they pause the line for QC check. Every hour, the lab staff pulls a bottle and tests the cork for TCA, ensures screw caps are sealing correctly, and performs analyses including sulfur dioxide checks, alcohol checks, dissolved oxygen tests, and CO2 checks. During the entire process, the label machine is monitored to ensure labels are being attached straight and smooth. As we make our way back to the lab, we realize the importance of the lab team’s work. 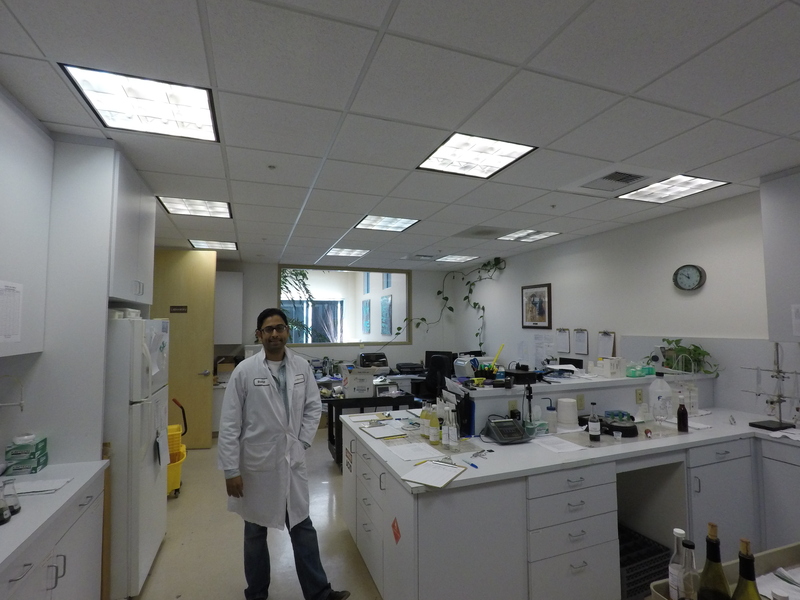 Lab Analyst Rohit in the lab. This isn’t just wine. It’s artistry and creativity as well as the product by which a winery remains in business. If MWC doesn’t perform, livelihoods, jobs, and dollars can be lost in the thousands of gallons of wine that didn’t measure up to expectations. There’s a lot riding on MWC’s reputation, and that rests squarely on the lab staff. In their small but perfectly laid-out lab, Richard, Megan, and Rohit handle the pressure of their role with a lighthearted seriousness. They’ve been working side by side for two years. Their teamwork and their expertise is clear, based on the shared passion and dedication both to the science and to the customer. Every day, each wine under MWC’s care is monitored for fermentation temperatures (80° F for red, 55° F for white) and brix level. 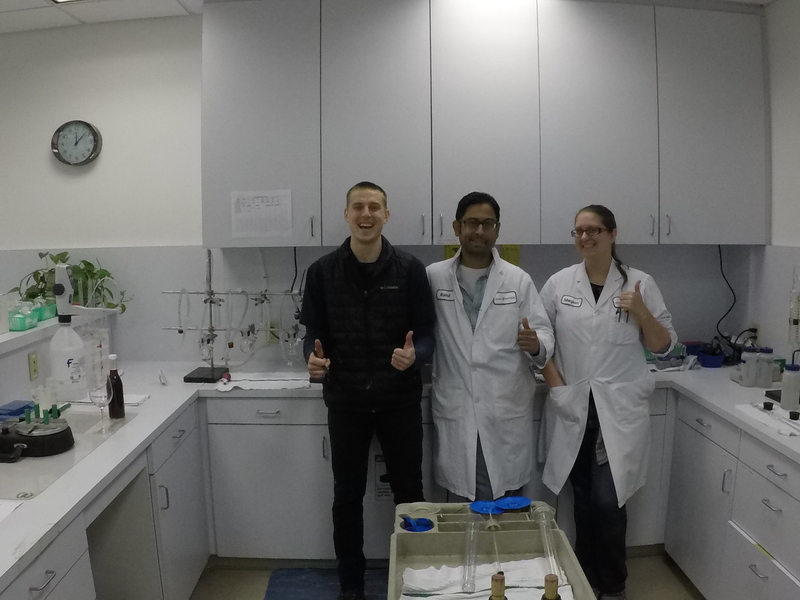 Every month, the lab team performs five tests: titratable acidity, pH, volatile acidity (which is performed on the Cash Still), free sulfur dioxide levels, and total sulfur dioxide levels. MWC uses the spectrophotometer to test glucose+fructose, and malic acid levels, along with other parameters during harvest (such as ammonium levels in the berries). Bacteria is the last test, and the full analysis takes about 20 minutes. If the lab staff discovers the wine is changing in a potentially undesirable way, they let the winemaker know. Some examples of undesirable changes in monthly analysis include decreasing levels of sulfur dioxide (as it acts as the primary preservative in wine), increasing levels of volatile acidity (which mainly manifests as increasing acetic acid levels), or high dissolved oxygen contents (which can cause premature oxidation and allow oxygen loving microbes to grow in wine, such as lactobacillus or acetobacteria). Wines are also analyzed before and after filtering, and before bottling. Winemakers can request other tests, including cold stability, heat stability, tannin levels, pH and total acidity, alcohol, free and total sulfur dioxide content, ammonium levels, sugar levels, and malic acid levels. All tests are according to the winemaker’s individual processes and preferences, which are captured in their Client Protocol and followed by MWC. This client focus provides start-to-finish quality. For small wineries, the lab’s input helps them through the winemaking process and results in best wine possible. For large wineries, the lab ensures quality and consistency for their large-production requirements. Not only does the lab provide testing during winemaking, but they can also provide quality testing of the grapes during the growing season to time optimal harvests. We wrap up our tour with a tasting overseen by winemaker Corneliu Dane, who has been with MWC for 11 years. Wine tasting led by Winemaker Corneliu Dane. He brings in several bottles of the Monterey Wine Company’s own wine brand, Poppy, in addition to several undisclosed client wines. About 85,000 cases are now produced under the Poppy label, which was launched in Southern California and is now available in many Whole Foods stores and other retailers in California, across the US, and abroad. Created as a separate division of MWC, Poppy allows both autonomy in winemaking expression and provides a way for Corneliu and his staff to keep their fingers on the pulse of the winemaking industry and seasonal conditions as they visit growers in Monterey County’s highest-quality appellations. Monterey Wine Company’s Poppy label. 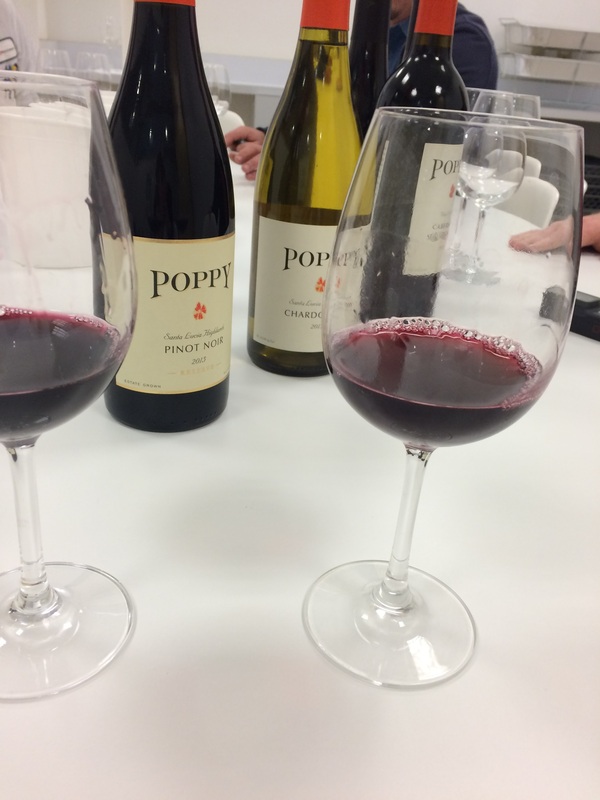 We taste several Poppy wines along with some examples of other wines to learn how different processes can affect the finished wine. For example, we taste two 2010 Merlot wines; one using Flash Détente and the not using the process. The wine using Flash Détente is fuller and more astringent from bigger tannins. We also taste two 2014 Cabernet Sauvignon wines from Paso Robles vineyards. The one not using Flash Détente is quite vegetal, while the bottle using Flash Détente has deeper color, good tannins, and balanced flavor. In addition, we taste examples of various flavors and stages of the wine making process, which we’ll cover in a later article. The central valley heat is a stark contrast to the cool MWC facility as we talk with Rohit a bit more on the way to the parking lot. What a great day — learning a bit more about the life of a wine chemist and how MWC bridges the gap between technology and nature, and how the human element influences both. The Monterey Wine Company Dream Team Corneliu Dane, Winemaker; Megan Burroughs, Lab Analyst; Rohit Deshpande, Lab Analyst; and Richard Dempsey, Lab Manager; with Andrew, Great Flavors Flavor Team Member. It’s clear everyone at MWC is walking their walk of winemaking: providing the latest technology on a cost-effective, commercial scale while maintaining the crucial and irreplaceable human touch of dedicated people. It starts — and ends — with unwavering focus on bringing the winemaker’s vision in the vineyard to life as the wine captured in the bottle. That’s a good day at the office.